Hans Holbein is documented for the second time in England in the summer of 1532. 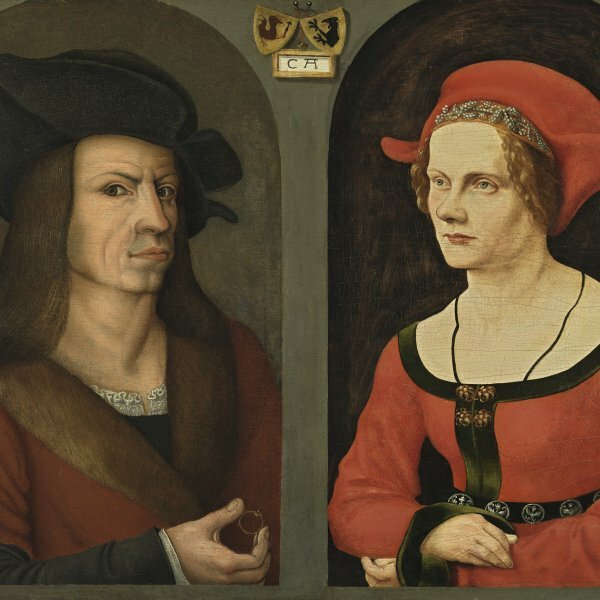 He continued to execute portraits and his principal clients during this difficult period were German merchants. This is the period of one of his greatest works, The Ambassadors of 1533 (National Gallery, London), in which he depicts the French ambassador Jean de Dinteville and his friend and fellow-countryman Georges de Selve, Bishop of Lavaur. Also dating from 1533 is the portrait of one of Holbein’s first English sitters, Robert Cheseman (Mauritshuis, The Hague) in which the sitter is presented in a horizontal format against a blue background holding a falcon. 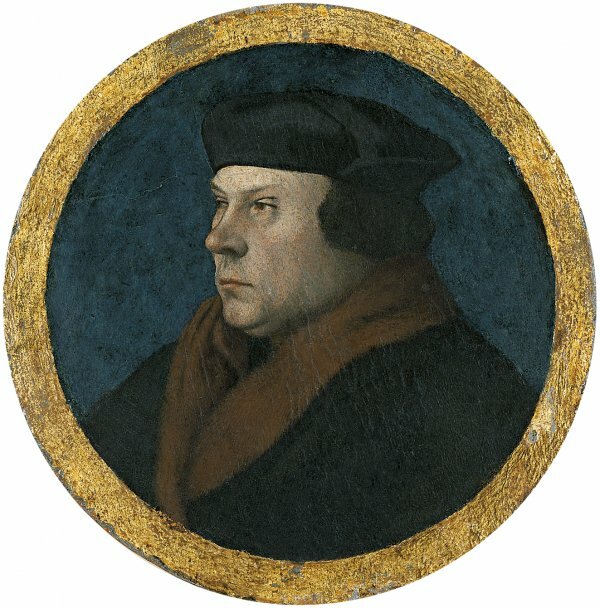 The panel depicting Thomas Cromwell in the Frick Collection in New York has been dated around 1533–34. It depicts Cromwell with a grave expression, seated on a bench before a table with papers, a book and a pen among other objects. Cromwell wears a coat with a fur collar and a hat while the setting is created from large areas of flat colour such as the blue of the textile on the wall, the ochre tones of the wood and the green of the rug on the table. This tondo with a portrait of Thomas Cromwell is an abbreviated but close copy of the Frick image. Cromwell looks to the left in more than half-profile with his close-cropped hair covered with the same hat. The band of fur around his neck is, however, narrower than in the Frick painting. The background has been simplified and only reproduces the colour of the textile in the New York painting. A comparison between the two reveals the lack of precision in the modelling and the significant difference in quality, factors that have led previous authors to suggest that the present work should be considered catalogued as “attributed to Hans Holbein”. This type of miniature with bust-length or half-length images was first developed at the court of François I and was popularized by the French court artist Jean Clouet. The format seems to have arrived in England around 1526, while it was also used by Lucas Cranach for some of his depictions of members of the House of Saxony. Holbein used these small, round portraits for his depictions of Melanchthon (Niedersächsische Landesgalerie, Hanover), for Erasmus and for a series of portraits of English courtiers, many of them now in the Royal Collection, Windsor. This small portrait has been in the Thyssen-Bornemisza collection since 1978. Its earliest known provenance links it to Great Britain where it was in Leicester then in London with Colin Agnew. It was subsequently in New York with the Seligmann gallery and in the Crispo collection before entering the Thyssen-Bornemisza collection at the Villa Favorita. Thomas Cromwell (Putney, 1485–London, 1540) worked for Thomas Wolsey then on Wolsey’s death entered the service of Henry VIII. He occupied various positions until 1534 when he became the King’s Secretary. In 1539 he was made Chancellor and Earl of Essex. Cromwell played an important role in Henry’s marriage to Anne of Cleves. He was beheaded in the Tower of London on 28 July 1540.